I often turn to the bottle to add intricacies of flavor and intrigue to a dish. Generally the alcohol is used to deglaze a pan for a quick sauce, or as a component of a braising liquid for a dish requiring more time. My basic rule of thumb is for chicken and fish, I use a Chardonnay or Sauvignon Blanc, for beef a decent red and for pork, a dark beer. Of course rules are meant to be broken — last year I made a memorable pork dish with a Riesling, but I’m referencing generalities. During the fall, I crave the flavors of pork and beer. My husband and I have been enjoying (in moderation; this beer delivers a kick) Michigan-produced Dragon’s Milk. To date, I’ve used it as an ingredient in barbecue sauces and as the base for an ice cream floats. I used a couple of tablespoons of it in today’s recipe; however, any rich, dark beer may be substituted. 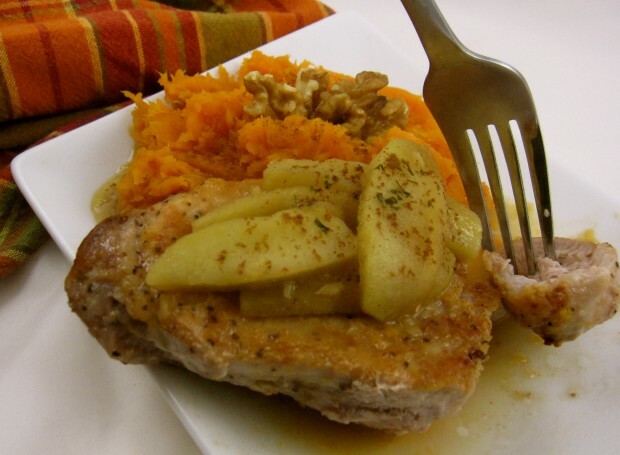 The dish is marvelous with smashed sweet potatoes, which taste great with the sauce. Rinse pork chops and pat dry. Combine the stock, beer and maple syrup in a measuring cup or small bowl; set aside. Season pork with kosher salt and freshly ground pepper. Put flour on a plate and dredge chops in flour; shake off the excess. Heat a large saute pan on medium-high heat for 1 minute. Add the oil and when hot, set the chops in the pan. (Do not crowd chops; cook in batches if necessary.) Cook until one side is golden, 4-5 minutes. Turn the pieces and cook until the other sides are golden, an additional 3-4 minutes. Remove chops from pan and remove saute pan from heat. Arrange chops on foil-lined sheet pan; place on center rack of oven. Continue cooking chops until just cooked through, five to ten minutes, depending on thickness of chop. While chops continue to cook, return saute pan to medium-high heat. Add ginger and garlic to the pan and stir constantly until they begin to turn golden, about 20 seconds; deglaze pan with maple-beer mixture, scraping up any browned bits from bottom and sides of pan. Add sliced apples and gently boil until the sauce has reduced by about two-thirds, about 4 minutes. Remove from heat and stir in butter, if using. Season to taste with kosher salt and freshly ground pepper. Spoon sauce over chops. Lightly sprinkle with cinnamon, if using, and serve.